1) Spend time really reading this site (it is in ‘citizen-speak’. You will find information written with understandable science). •Read articles in the BLOG section. 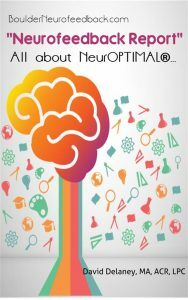 •Get in depth understanding in why NeurOptimal® is the safest neurofeedback technology in use today; and not a medical device but a general wellness device as determined by the FDA which means anyone can use it. 2) Listen to this interview with Valdeane Brown, PhD., the developer of NeurOPTIMAL® neurofeedback for this reason: Here is the link. Val Brown, Ph.D., is a trainer of trainers and a leader in the field. He has owned, operated, been certified and taught almost every major neurofeedback system in use today and knows what is happening ‘under the hood’ in all the systems in use. He is a great authority of where the field is today and how our approach is up to date with current physics and math, and in line with the most recent research and understanding about how adaptable and plastic our brains are, if we know how to mirror back to them their own dysfunctional behavior. Here is the link.